Welcome to my Blog: This opening post explains why I choose the title of this blog, defines some key terms I use, and briefly explains some of my plans for this blog. About Me: What more is there to say? This post explains all about me: my family, my upbringing, my mission, my education, my interest, and my marriage to my wonderful wife McKall. The Purpose of my Blog: This posting explains in detail my what motivated me to start writing about LDS apologetics, and what I hoped to achieve with this blog, including secondary goals that go somewhat beyond the scholarly and apologetic fields. My Testimony: On this posting, I explained what I believe the is process of gaining a testimony/discovering truth. I explain four different means of discovery and how all four interact with each other and how each plays a role in one’s testimony. In the end, I share the testimony I have in the Gospel of Jesus Christ as represented in the LDS Church. Why I Choose to Believe: A post where I explain my personal, non-revelatory reasons for choosing to believe in the Church of Jesus Christ of Latter-day Saints, despite questions or doubts that arise from time to time. Novum Nomen - Studio et Quoque Fide: This post explains the new name and provides my take on the meaning of the passage in the Doctrine and Covenants to which it refers. I also provide an updated explanation of what this blog is all about. Stay up-to-date on the goals and aims of this blog and my other apologetic-relevant activities by reading the occasional Blog Updates. I originally had no intention of explaining what apologetics is. However, when someone misunderstood my use of the term on a discussion board, I decided it might be good to provide a little bit of an explanation. Many people misunderstand what “apologetics” means, and (understandably enough) assume it is related to apologizing, or saying sorry. This, however, is not the case. Apologetics involves giving reasons for, or defending, what you think or believe. Most of us are involved in some basic apologetics of some sort or another on a daily basis. We all have our reasons for believing, thinking, and feeling the way we do about things. Anytime in which we are asked to explain why we think, or believe, of feel that way (whether it is because of hostile questioning, or simple curiosity) we are engaged in some informal apologetics. Formally, apologetics is typically a defense of a religious belief and involves using logic, argument, and evidence to support your reasoning and belief. Some people suggest that apologetics is not appropriate for Latter-day Saints. This is not true. The work of LDS apologists has been featured in Church publications, including Sunday school and institute manuals, as well as the Ensign. Various general authorities have engaged in apologetics over the pulpit. Orson and Parley Pratt, John Taylor, John A. Widstoe, B.H. Roberts, James E. Talmage, and Bruce R. McConkie are all examples of General Authorities who have, to varying degrees, written or spoken apologetically. Most recently, several of Elder Jeffery R. Holland’s General Conference talks have had an apologetic nature . So, there is nothing particularly wrong with being involved in apologetics. Certainly, as with all things, there is both good apologetics and bad apologetics. Here, I make every effort to use good, sound reasoning, quality scholarship, and honest representation of evidence. In short, I sincerely try to practice “good apologetics.” Please understand I am imperfect, and I may make mistakes. As such, I welcome any and all feedback which may help me improve. Editor’s Note: This is the fourth contribution to my new series Nephite History in Context: Artifacts, Inscriptions, and Texts Relevant to the Book of Mormon. Check out the really cool (and official, citable) PDF version here. To learn more about this series, read the introduction here. To find other posts in the series, see here. 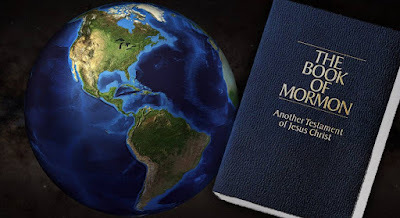 About a month ago, the Church of Jesus Christ of Latter-day Saints released a statement on the geography of the Book of Mormon, and even more recently it has made some revisions and changes to that statement. It’s short, and sweet, and to the point. Some may be tempted to significantly add to it or bicker over its wording, but I think to do so would be inconsistent with the spirit and purpose of the statement, and be a kin to “steadying the ark,” as it were. The Church has said what its chosen to say, and even made modifications to further clarify its intent. I have no doubt that the Church was deliberate and judicious in doing so. As such, I think it’s worth it to look carefully at some of the key statements and consider their implications for discussions about Book of Mormon geography going forward. I’d recommend, of course, that you read the whole thing for yourself and come to your own conclusions. Editor’s Note: This is the third contribution to my new series Nephite History in Context: Artifacts, Inscriptions, and Texts Relevant to the Book of Mormon. Check out the really cool (and official, citable) PDF version here. To learn more about this series, read the introduction here. To find other posts in the series, see here.